It’s still unseasonably cold. Most of us never got our jackets off, and a breeze of 5-8 mph made it feel chillier. I know, I know, I shouldn’t be complaining about temperatures in the high 60’s when people are freezing in Mongolia or fighting tyranny house-to-house in Libya, Yemen, Sudan, Ivory Coast, Liberia, and on and on. But if you can’t complain about the weather, what else is there to complain about? Politics? Why, everything in politics is perfect, in this best of all possible worlds. 315 5/22/05, 400 3/26/06, 230 4/22/07, 630 5/27/07, 239 6/24/07, 320 3/23/08, 231 5/25/08, 256 1/25/09, 205 6/27/10, 740 4/24/11. The total species count at 55 seemed a bit low for April, so I checked and for the past eleven years, we’ve averaged 59 species in April, with a low of 52 and a high of 70. 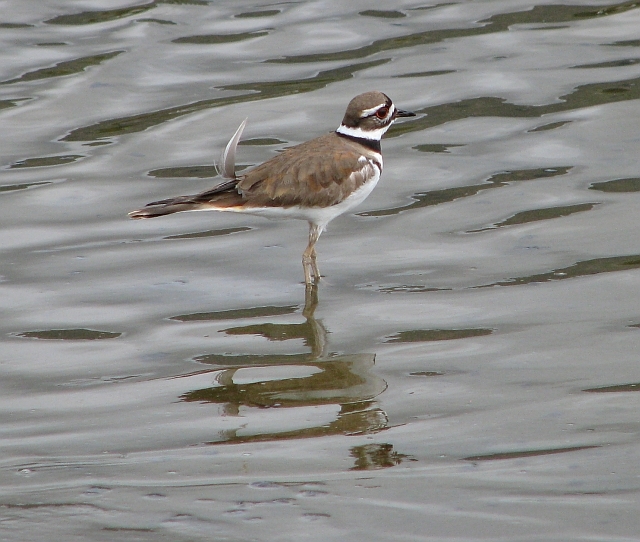 Out on the beach inland of the (now deserted) Snowy Plover enclosure, we startled a Killdeer, who proceeded to stagger and flop off with what appeared to be a broken wing. As most birders should know, this is a distraction display the adult puts on to lure a potential predator away from its nest. Lu quickly found the nest about 10 ft away from where we stood. I took a few pictures and then we dutifully followed the adult away so it could win this skirmish. 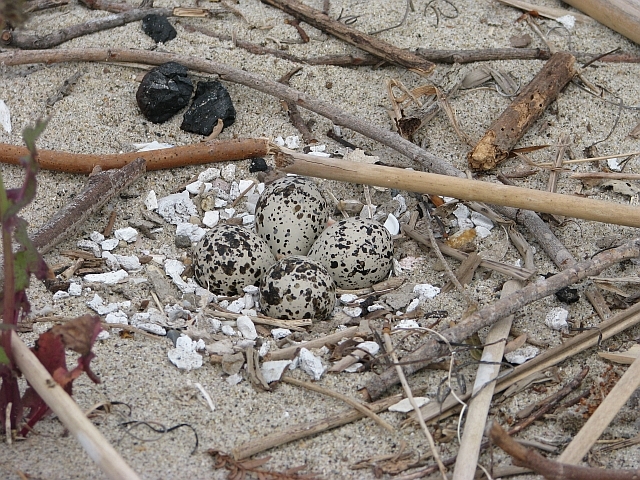 Hopefully no crow or gull was paying attention and the nest remains safe among the sticks and pebbles.